Windows 7 allows you to change Login Screen without any cracks or hacks into the Operating System. Windows 8 on the other hand provides different mechanism for the Login Screen Change. Whether you are using 32 bit version of Windows 7 or using 64 bit version, the software presented here can be used to change the login screen of a Windows 7 computer. Whether you are using Windows 7 on a Desktop Computer or on a Laptop Computer, the software presented here will work fine on any version of Windows 7. The Login Screen Image we are talking about here is the screen that is displayed before you logon to your Windows 7 computer protected by a password. The Login Screen is also displayed on computer startup if multiple users are configured on the same machine. In case of multiple users configured on a Windows 7 computer, the computer will wait for you to click on any of the users configured on your machine. The Login Screen is also displayed when you lock the computer using any 3rd party software application or by pressing Windows Key on Keyboard and L Key. As the above screenshot of the software displays, all you would need to do is select any of the images by clicking on the image thumbnail and then click on the button labelled Set As Login Screen. 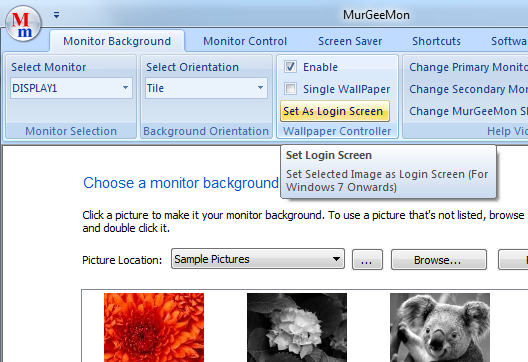 Changing the Login Screen with MurGeeMon is as simple as changing desktop background and does not requires struggling with registry keys or handling image sizes. In case you would like to go the hard way, here it is. Open up Registry Editor or use the command line RegEdit to start the Registry Editor with Admin Access. Once you do have the Registry Editor in front of you, navigate to HKLM\Software\Microsoft\Windows\CurrentVersion\Authentication\LogonUIBackground and create a DWORD sub key named OEMBackground and set it’s value to 1. In case your registry does has the OEMBackground key, look for it’s value and set it to 1. You are half way done in getting your customized Login Screen on a Windows 7 Computer. The next step you need to do is to look for an appropriate image (.jpg file) of size less than or max 256 KB. In case the image or picture you want to set as Login Screen on your Windows 7 computer is of size greater than 256 KB, you would either need to reduce it’s size or look for some different image. In case the Resolution of the desired image is greater than your current monitor resolution, you can decrease the resolution of the image using Image Resizer. You can also use the Image Resizer to convert an image to .jpg file format. Once you do have a picture file in .jpg file format of size on disk less than 256 KB, you are ready to go ahead to the next step. The final step is to rename the picture file to backgroundDefault.jpg and copy it to the folder C:\Windows\System32\oobe\Info\Backgrounds. In case you have your Windows 7 installed onto the D:\ drive, you would need to copy the backgroundDefault.jpg image file to D:\Windows\System32\oobe\Info\Backgrounds and so on. In case you have followed the steps outlined above correctly, your windows 7 computer will have a new login screen set to the backgroundDefault.jpg file. In case you want to change the Login Screen again, just overwrite the backgroundDefault.jpg file with a new .jpg file and your Login Screen will be changed automatically, there is no need to redo the registry settings again. However in case you would like to revert back to the default Windows 7 login screen, you can either delete the backgroundDefault.jpg image file at the oobe folder or change the OEMBackground in the registry to 0. Windows 8 is not yet fully released by Microsoft and only a pre beta version of Windows 8 download is available from Microsoft’s Website. The steps outlined above talking about changing registry settings, copying the image file to oobe folder to change the Login Screen of Windows 7 does not works on current version of Windows 8. The software mentioned above for changing the login screen of Windows 7 follows the same registry handling, image resizing and copying of the image file and hence it will not be able to change the Login Screen of Windows 8 as well.